This graphic novel teams up two of my favorite characters. Bruce Wayne knows the Shadow as “Lamont Cranston.” For the Shadow, this takes place after The Death of Margo Lane, also published by Dynamite. 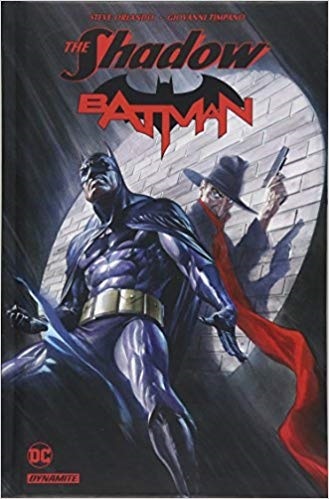 I recall years ago the Shadow and Batman crossed paths in a comic, but I don’t recall the comic series (other than it was a Batman) nor do I recall the circumstances. The book begins with a case Batman and Robin (Damian Wayne) face against Professor Pyg. The Shadow approaches Pyg in a cell in Manhattan and is upset at something he reads in Pyg’s mind. The Silent Seven, a group the Shadow defeated once before, have moved into Gotham and the Shadow is there tracing them. Along the way, we find out the Seven were founded by Professor James Moriarty! Damian Wayne, aka Robin, is in one of his usual snits and has decamped to New York to investigate on his own. A fake Batman confronts Damian, but he isn’t fooled. After an attack by the Silent Seven, Damian, Batman, and the Shadow join forces. Damian senses a mind behind the Seven and Pyg’s “Dolltrons.” And there is a major mind there—Shiwan Khan! Khan has control of people he calls his “dead men.” According to Khan, they were once dead, and he has raised them up as slaves of his will. He even hints that Batman is a raised dead man and so subject to his will. I liked this book very much. While I would always see a pairing of the Batman and the Shadow, I wouldn’t have thought Khan and Ra’s al Ghul could ever work, as both have such tremendous egos. But it works fairly well. The book has a ton of Easter eggs! For example, Margo Lane is buried in “The Blue Coal Cemetery.” Blue Coal® was a major sponsor of the Shadow radio series.